The Big Apple, The City That Never Sleeps, call it what you like; New York is, without a doubt, one of the most popular and one of the liveliest of all cities. There is so much to see and do, famous landmarks at every turn and even those who live there probably haven’t seen it all. Some people visit for the shows on Broadway, others to shop in 5th Avenue but most go just to see the city and all it has to offer. Unless you are visiting for several months, you won’t have time to fit everything in but there are some sights that you really should make time to see. 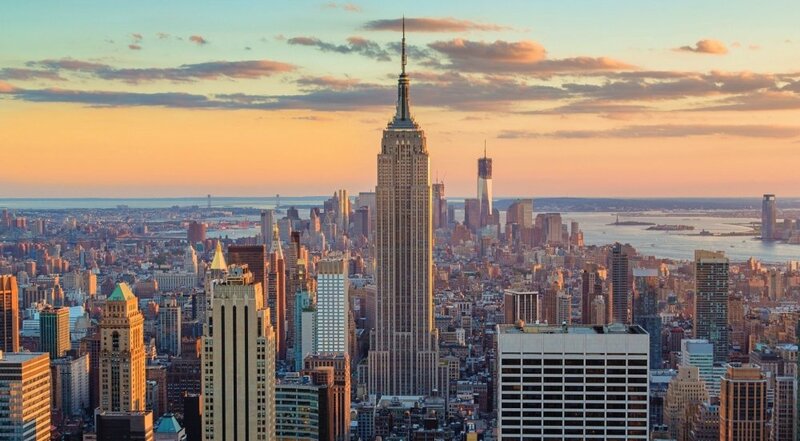 So, to help you with your itinerary, these are the top 8 places to visit in New York. You cannot visit New York without visiting the Statue of Liberty. 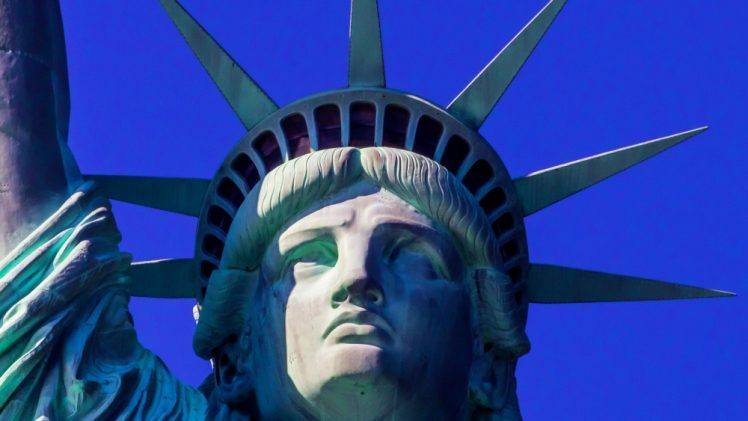 Given to America by France, the Statue was built in 1886 and is still the most iconic symbol of freedom in the world, not to mention the most famous icon in the USA. At a little under 152 feet tall, the Statue is one of the biggest in the world, weighing in at around 450,000 pounds. The best way to appreciate the Statue is to visit Liberty Island on a boat trip and get up close to it. Walk around the statue’s base, go into the pedestal or, provided you make a reservation in advance, go right to the top. 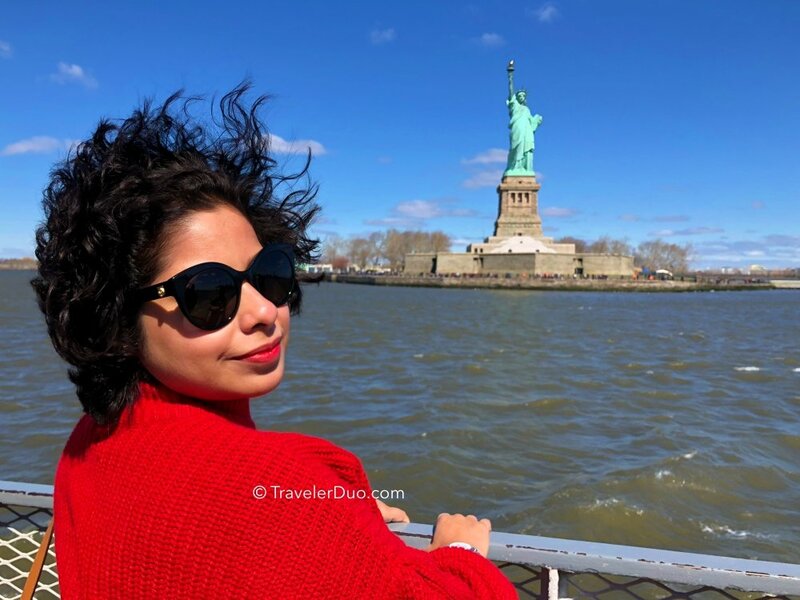 If you take in a boat tour to the statue, you can also make a stop at the infamous Ellis Island and tour the Immigration Museum, charting the stories of those who came to the US and were processed before being able to enter the country. You must purchase a ticket in advance, especially during the high season, as they sell out very fast. Allow around 3 hours for the Statue and Ellis Island and make sure you only purchase your ticket through official avenues – there are plenty of hawkers waiting to charge you more than you should be paying! 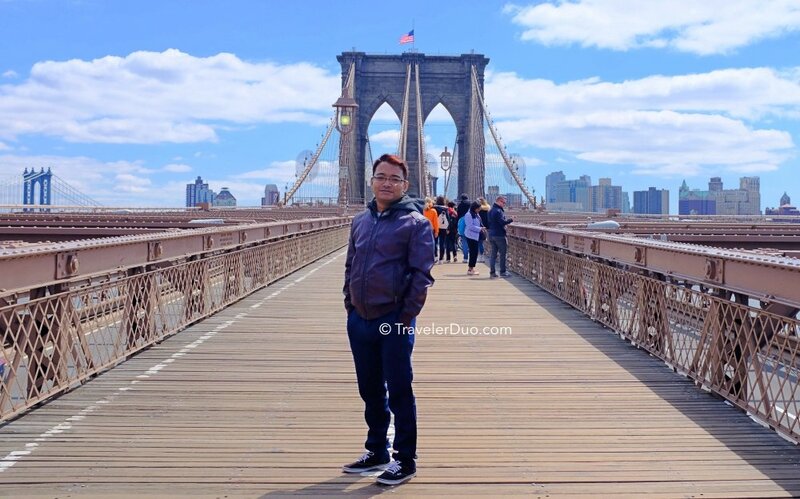 Brooklyn Bridge is one of the most famous landmarks of New York, with its suspension cables and gothic arches, inspiring musician, poets, and painters for generations. Building work finished in 1883, and the Brooklyn Bridge, going from Brooklyn across the East River to Manhattan, became the first ever steel suspension bridge in the world. It can be seen from any of many ferries that travel the river but the very best way to explore and take it all in is to walk the bridge from one side to the other, about an hour. A pedestrian walkway, made of wood, is above the traffic but, if you can’t make the entire journey, stop at the first pillar where you will find a viewing platform; from here you can get close to one of the massive granite pillars and you can see over Manhattan, the river and the Statue of Liberty. Bridge access starts well before the river’s edge. Another of the most famous landmarks in New York, you can’t visit the city and not go to the Empire State Building. At 381 meters high, the 102-storey building was the tallest in the world until, 41 years later, the very first World Trade Center was built, leaving the Empire State Building in the shadows. Opened in 1931, the Empire State Building became one of the icons of New York, with an airship mooring mast right at the top. There are two observatories at the top, both offering magnificent views of up to 80 miles. On a clear day, you can even see into the next states of Pennsylvania, Massachusetts, New Jersey and Connecticut. The highest open-air viewing deck in the city is the 86th Floor Observatory and is where most visitors head. This is the deck you see in the movies and has an area enclosed in glass and open-air walkways around the entire building. If you want to go higher, head to the 102nd floor, to the Top Deck Observatory, which is completely enclosed. Be prepared for a long wait – the queues to go into the building are always long. You can purchase a ticket in advance along with a Skip the Line ticket, which lets you skip the queues. As this is a flexible ticket, lasting for a year, if you can’t get to the Empire State Building or the weather doesn’t allow, you can go another day. Perhaps one of the most tragic memorials in the city, the 9/11 Memorial stands on the site where the iconic Twin Towers of The World Trade Center stood before they were brought to the ground by suicide bombers flying jets on September 11, 2001. 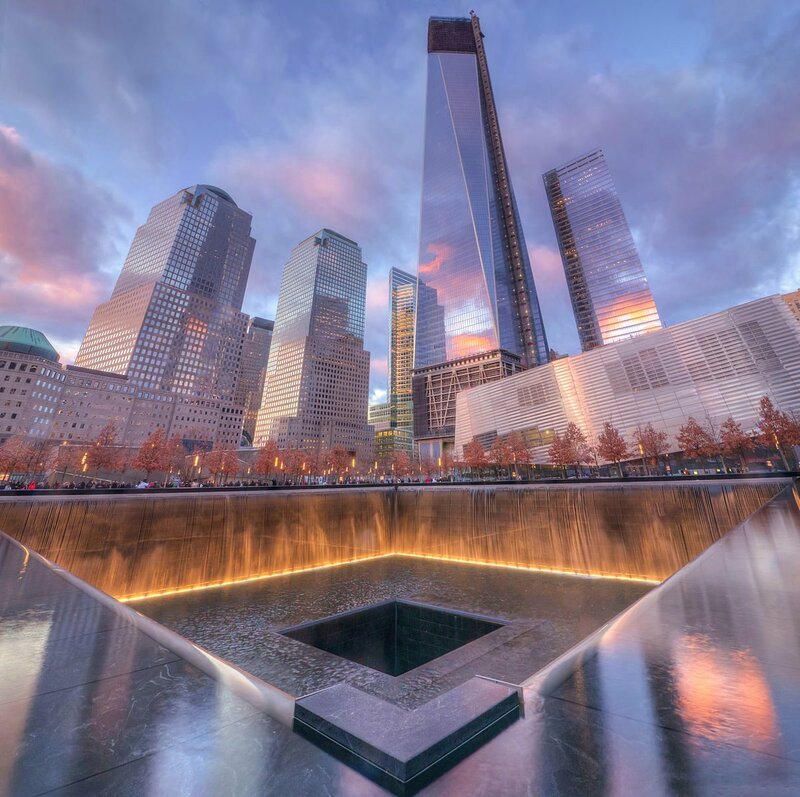 The memorial consists of two reflecting pools, each covering an acre and was erected as a memorial to all those who lost their lives, not just in this attack, but in the attack on the earlier WTC bombing in 1993. The pools are surrounded by grass and trees and each is set in a recess. Water cascades over the pool sides and into an apparently bottomless square. They are biggest man-made waterfalls in the country and are surrounded by brass panels that bear the names of each person who lost their lives in both attacks. Between the pools is a curved glass building that houses the Memorial Museum. Here you can view moving displays of photos, videos, and artifacts, laying out the story of the attack, the aftermath and the impact it had. The museum is built around the remains of the WTC and contains the old structures, incorporated into the building. Times Square is the where the New York New Year celebrations take place, where the ball drops at midnight over thousands of people. 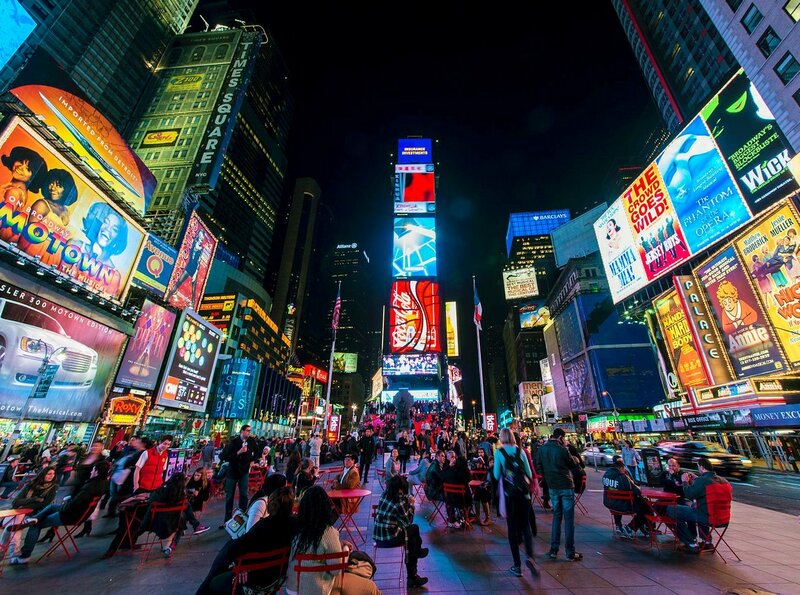 It is a busy place at any time but is best seen at night, when the screens and huge lit billboards flash color and a unique brand of appeal over the square. Head to the bleachers at one end of the square to sit and drink in the scene. Times Square was once called Longacre Square but, in 1904, it was renamed Times Square after the New York Times Tower. In 1928, the New York Times posted, on a moving sign, their current headlines, making them the first in the world to do this. Wall Street is a world-famous financial district, stretching from Broadway over 8 blocks to South Street. Some of the most important exchanges in the world are found in these streets, including NASDAQ, New York Stock Exchange, and the New York Mercantile Exchange. You will also see the Federal Hall, Trinity Church, and the Charging Bull statue, located on Broadway at Bowling Green. 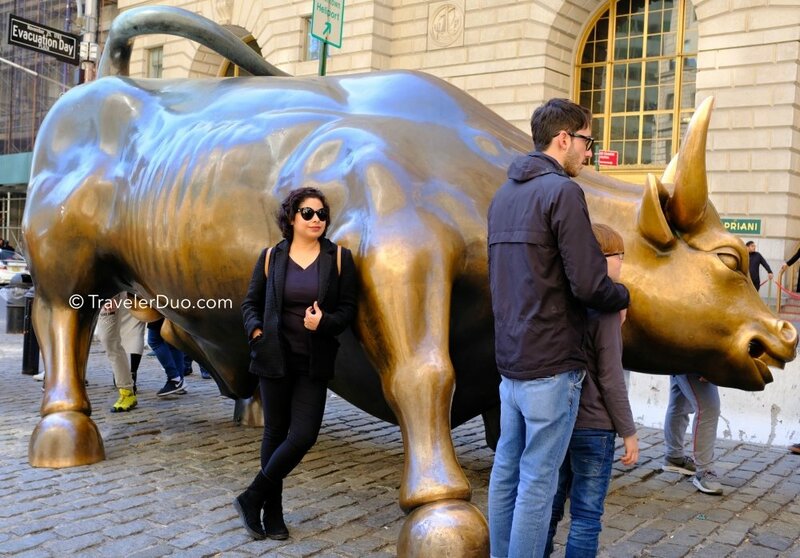 Wall Street attracts millions of visitors every year and is one of the more popular of the tourist attractions and photo hotspots. 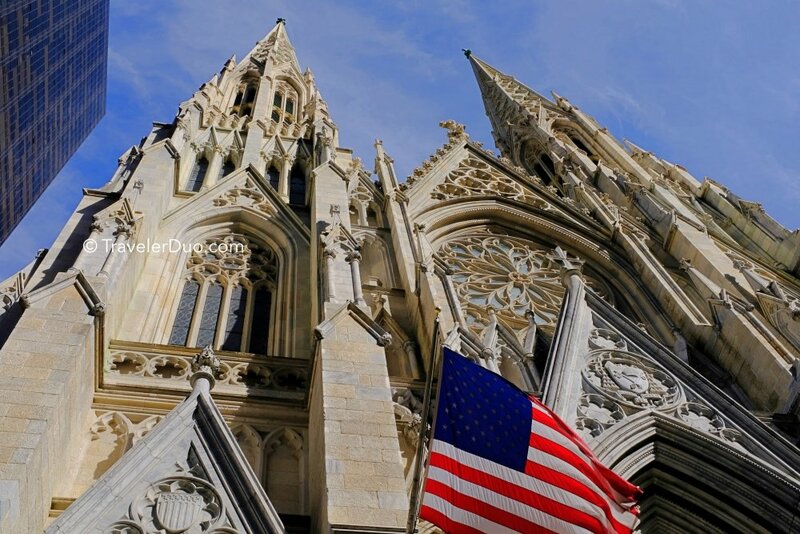 One of the best examples of Gothic Revival in New York, St Patrick’s Cathedral features huge bronze doors, spires that tower up to 330 feet, a seating capacity of 2400, the Great Organ, and, to the side of the Lady Chapel, the Statue of Pieta. Millions of people visit St Patrick’s every year, both tourists and believers. Built in 1879, the Cathedral has undergone careful restoration and has been maintained through its life, with a $200 million renovation being finished in 2016. 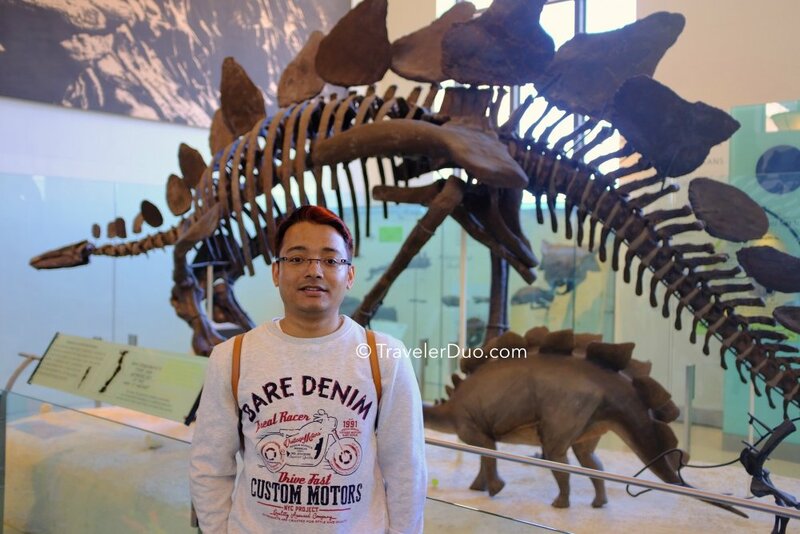 148 years old, the Natural History Museum in New York is home to some breath-taking displays, including a blue whale at 94 feet long, skeletons of an Allosaurus and a Barosaurus and a huge grizzly bear. The museum covers 4 floors, home to thousands of artifacts, including taxidermy animals from the rain forests, Asia, North America, Africa and the ocean. There are halls that are dedicated to the various American Indian cultures, the Africans, the Asians and the Pacific people, and the origins of the Neanderthals and other first humans. 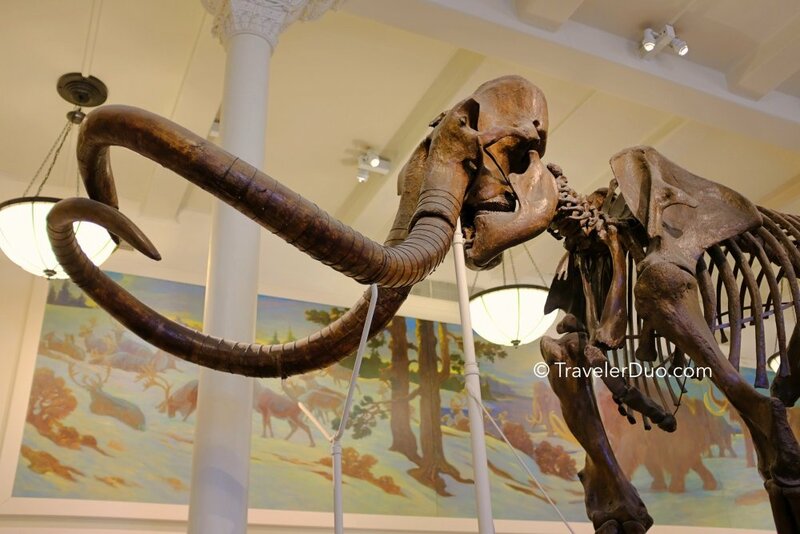 Other halls contain rocks, gems and minerals and, perhaps the most famous display of all, the fossil collection, where you will find a Wooly Mammoth and a Tyrannosaurus Rex. You could easily spend a day wandering the halls of this amazing museum and, while admission is by a suggested donation of $23, if you want to visit the Butterfly Conservatory, the Space Show that takes place in the Haydn Planetarium or other specialist displays, you will have to pay extra. These 8 are just a small part of New York but perhaps some of the most iconic landmarks there are, not just in the city but perhaps in the world as well. New York is a bustling, lively place, full of people, things to do, places to see and sights and experiences to take in; in the words of Gerard Kenny, singer and songwriter, “New York, New York, so good they named it twice”. Sourish is an avid Traveler and an amateur photographer who love to explore new places, people, cultures and cuisine. 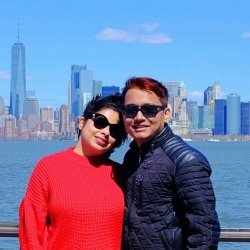 Sourish and Arpita are avid travellers who like to document their travelling and share it with the world to bring you the best travel destinations and experiences on the planet .